Figure 18.8. A rapid drop in λ sFLCs provides an early indication of response to treatment. By contrast, IgG levels remained high for almost 2 months. Subsequently, a lack of treatment effect was indicated by stable λ sFLC levels despite decreasing IgG levels. Several months later, relapse was confirmed by an increase in both λ sFLC and IgG concentrations. Monitoring with sFLCs allows early detection of ineffective treatment, and the identification of patients who may benefit from alternative chemotherapy regimens. 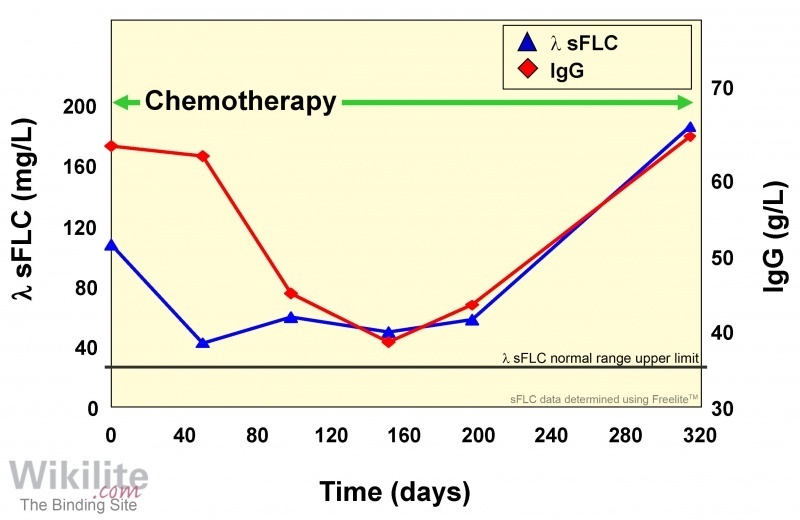 One such example is shown in Figure 18.8 In this patient with IgGλ MM, the sFLC concentration initially decreased in response to treatment, with a negligible corresponding change in IgG concentration. Subsequently, λ sFLC levels stabilised, indicating that the patient was no longer responding to treatment. This was in contrast to the IgG levels, which were continuing to fall, suggesting a continuing response. Only after several months did IgG levels start to increase, signifying a tumour regrowth.